The U.S. auto industry has seen few transformations as dramatic as the one Chrysler underwent between 1949 and 1955. 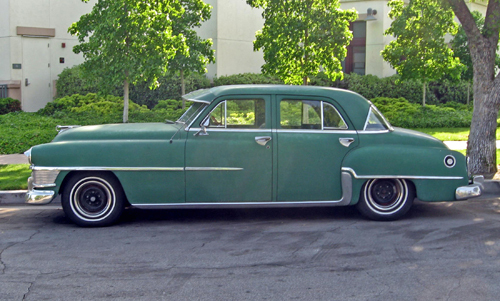 In 1949, Chrysler’s cars were sensible, conservative, and dull, with sleepy performance and stolid styling. Six years later, the corporation offered some of Detroit’s sleekest designs and strongest engines, culminating in the launch of America’s most powerful car, the 300. In this installment of Ate Up With Motor, we take a look at the 1949-1954 Chryslers, the Exner/Ghia idea cars, and the birth of the FirePower Hemi. As with most automakers, the first cars Chrysler introduced after World War II were touched-up versions of the company’s prewar designs. Although some styling work had continued during the war, the buying public was so hungry for any new car with four wheels, an engine, and four new tires that Chrysler did not launch its first true postwar designs until the spring of 1949, the company’s 25th anniversary. Bucking the trends of the time, Chrysler’s new models emphasized packaging efficiency over styling flair. Wheelbases were increased on most models, but overall length and width decreased significantly. Although overall height was reduced by as much as 2.3 inches (57 mm), slab sides, greater glass area, and altered proportions conspired to make the new cars look unfashionably tall and upright. Chrysler received much criticism for frumpy styling, but for customers more concerned with substance than flash, the new models had much to offer, including good visibility, easy entry and exit, and roomy interiors that belied the tidier exterior dimensions. Under the hood, the vast majority — more than 95% — of Chrysler Corporation products had six-cylinder engines. 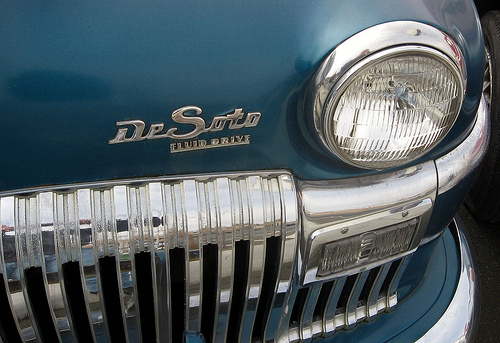 The corporation introduced its first eights in the DeSoto and Dodge lines in 1930 and in senior Chryslers in January 1931, but sales were disappointing. The DeSoto eight was dropped in 1933, the Dodge eight in 1934, and neither Plymouth nor the truck lines ever offered more than six cylinders. By 1949, Chrysler’s sole eight-cylinder engine was the Spitfire Eight, offered only in the senior Chrysler models. A direct descendant of the straight-eights introduced by Dodge and DeSoto in January 1930, the Spitfire Eight was a 324 cu. in. (5,302 cc) L-head engine with five main bearings and 7.25:1 compression, making a modest 135 gross horsepower (101 kW) and 270 lb-ft (366 N-m) of torque. Most Chrysler buyers opted for the cheaper Royal or Windsor, which had the 116 hp (87 kW), 251 cu. in. (4,106 cc) L-head Spitfire Six, in many respects a larger version of the sixes powering contemporary Plymouths, Dodges, and DeSotos. In most 1949 Chryslers and a substantial number of DeSotos and Dodges, these engines were mated with Fluid Drive and Chrysler’s M-6 semiautomatic transmission, variously called Gyrol, Prestomatic, and Gyro-Matic. The M-6 was as close as Chrysler had yet come to an automatic transmission, a hydraulically operated four-speed gearbox that combined both a conventional friction clutch and a fluid coupling. The gear selector provided a choice of High and Low ranges, offering automatic shifting to and from third and fourth and first and second, respectively. Since the shift pattern didn’t make it easy to go through the gears (starting in Low and shifting manually to High would generally give you first, second, and fourth), many people simply left the transmission in High for most normal driving. The fluid coupling eliminated the need to declutch at idle, so the clutch pedal was needed only for shifting from High to Low range or into reverse. The semiautomatic transmission worked well enough, although it made for sedate performance, particularly if left in High range. Motor Trend noted that by manually shifting between Low and High, you could coax a six-cylinder Windsor to 60 mph (97 km/h) in under 20 seconds, acceptable but unimpressive for the time. Eight-cylinder cars were not much faster, since even the lightest eight-cylinder Saratogas were around 440 lb (200 kg) heavier than a comparable Windsor. No Chrysler was a match for the latest eight-cylinder Oldsmobiles or Cadillacs, with their powerful OHV V8 engines and fully automatic four-speed Hydra-Matic transmissions. Chrysler products of this era were in no way exciting, but they were practical, soundly engineered, and had a reputation for durability. That was enough for many buyers in the brief interregnum between the postwar boom and the beginning of the Korean War: Sales were good in 1949 and even better for the mildly touched-up 1950 models. 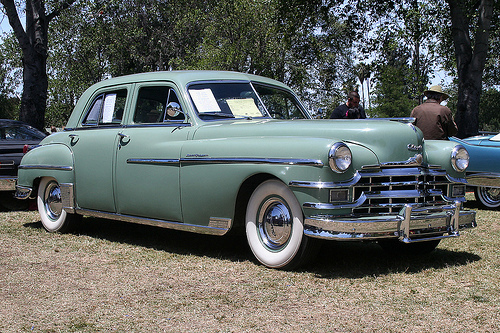 Despite a lengthy strike that shut down production for nearly four months in early 1950, Chrysler sold almost 1.4 million cars and trucks for the model year, one of the company’s best years. Despite those encouraging figures, it was hard not to notice that stubborn conservatism was fast becoming Chrysler’s defining trait. Two decades earlier, the company had often led the industry in engineering and, through the mid-thirties, had turned out some quite stylish products, as well. Now, Chrysler seemed to be lagging behind. There were two primary reasons for the company’s reactionary streak. The first was the Airflow, an adventuresome engineering showcase that became a commercial debacle due to oddball looks and too-high prices. As we’ve previously discussed, many senior Chrysler executives had doubts about the Airflow from the start and its failure soured their appetite for innovation — stylistic or mechanical — for years afterward. The second factor, even more significant than the first, was the influence of Chrysler’s president, Kaufman Thuma Keller. K.T. Keller was a longtime veteran of the auto business and before that the railroad industry. After stints at Hudson and Maxwell, he joined Buick, which is where he first met Walter P. Chrysler. In 1926, Chrysler lured Keller away from the vice presidency of Chevrolet to become the vice president of manufacturing for the new Chrysler Corporation. Less than two years later, Chrysler assigned Keller to run Dodge, which Chrysler had just acquired. Keller became president of Dodge in 1929 and six years later succeeded the ailing Walter Chrysler as president of the entire company. Keller ceded the presidency to L.L. (Tex) Colbert in November 1950, but remained chairman of the board until April 1956. Keller was a big man with a blunt, no-nonsense demeanor. Former colleagues characterized him as a superbly talented production engineer and a determined autocrat with a penchant for micromanagement. He was open to others’ ideas to a point, but once his mind made up, he wasn’t easily swayed. Designers Ray Dietrich and Virgil Exner (of whom we’ll have more to say shortly) noted that Keller was not without a sense of humor and had a bemused appreciation for the few people brave enough or foolhardy enough to stand up to him — which admittedly didn’t happen very often. While Keller ran Chrysler, his word was law. According to engineering executive Harry Chesebrough, later the head of Chrysler product planning, Keller had little liking for anything that smacked of unnecessary complexity. It was Keller, Chesebrough said, who decided that Chrysler didn’t need a fully automatic transmission, at least until the market forced the issue. 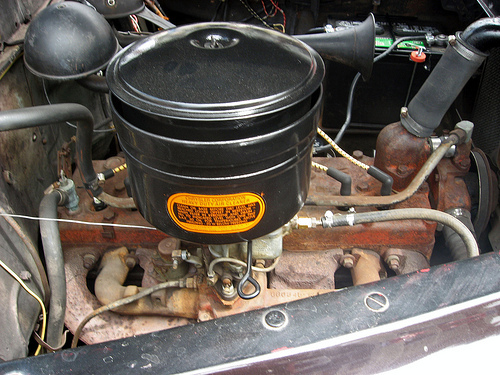 Chrysler could certainly have developed such a transmission by the early fifties — the company had never stinted on engineering resources — but Keller preferred the semiautomatic unit, which was simpler and cheaper than Hydra-Matic and considerably more efficient than Dynaflow or Packard’s Ultramatic. There were few areas of Chrysler’s operations in which Keller’s hand was not felt, least of all styling. 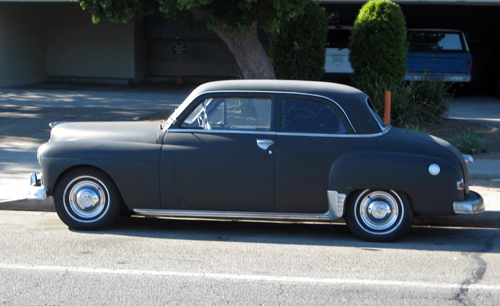 Chrysler had its share of styling talent in those days, led from 1944 by Henry King, but it was Keller who dictated the boxy shapes of the 1949 models, based on a concept generally attributed not to King, but to Charles G. Walker, then the head of the clay modeling section. According to Chesebrough, determined resistance from the division heads had resulted in some last-minute revisions — the principal reason the ’49 cars didn’t debut until spring — but in the main, the new models looked the way Keller thought they should look. We should emphasize that Keller was not necessarily resistant to swoopier or more sophisticated shapes. For example, he was very fond of the Chrysler Thunderbolt and Newport, a pair of sleek concept cars designed by Briggs Mfg. Co. in 1940-1941. However, Chrysler had always prioritized engineering over styling. Even discounting Keller’s personal involvement, stylists were subordinate to chief body engineer Oliver Hunt and through him to vice chairman Fred C. Zeder, one of Walter Chrysler’s original “Three Musketeers.” From an engineer’s perspective, simple, three-box shapes with bolt-on fenders and a minimum of complex curves were easier to manufacture and easier to repair — the sensible choice. 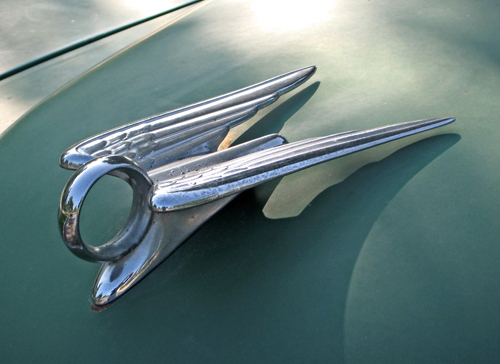 It’s also worth noting that Chrysler’s postwar designs were to some extent a response to dealer and customer feedback. Even in the forties, there were already grumblings that American cars were becoming too big, difficult to maneuver and hard to park. Chrysler’s 1949 models represented what many buyers said they wanted: spacious cars with modest exterior dimensions and, as Keller famously told students of Stanford University’s School of Business in 1948, enough room to wear a hat. Unfortunately, there is often some distance between what customers say they want and what they actually buy, particularly when the sensible choice is bland and dowdy. In 1949-1950, that was not yet a major commercial handicap, but it would cause Chrysler a great deal of trouble in a more competitive market.